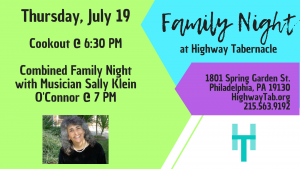 Join us Thursday, July 19 at 6:30 PM at Highway Tabernacle! We will have a cookout at 6:30 and concert at 7 PM! All age groups will be combined for a special service with musician Sally Klein O’Connor.